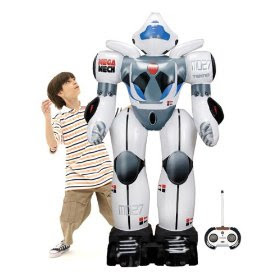 Mega Mech is an inflatable, talking robot that stands 4 feet tall. Yes 4" tall! It takes a whole lot of blowing up once purchased but you are supplied with an air pump to make it easy for you. Mega Mech talks in a robotic voice and you use the remote control to make him go forward, backwards, turn left or turn right. Got this for my little boy for Christmas and he loved it. We took it outside and my son felt so good about all the attention he was getting from other people with his new robot. I was really impressed with Mega Mech and would recommend this giant robot toy for anyone who has a kid from 4-10. Your child will be fascinated.